Ensuring your holiday homes are well maintained and well exposed is Trish Wilkes. Trish joined the Elders team with a background in banking. Her experience with trust accounts and bank reconciliations enables Trish to lead the Elders team to work confidently and efficiently when dealing with the financial side of managing your property. Not only does Trish have great people skills but has gained her Certificate 3 in Property Management, which further enhance her knowledge and skills in managing your property. 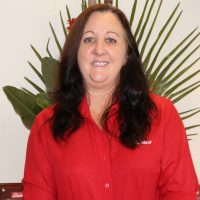 Trish has been living and working in South West Rocks for 20 years and has built up a strong customer service record. This coupled with her innate knowledge of the local area will ensure she gets the most from your property. Would you like to speak to Trish? If you’re thinking about renting or selling your property and you’d like a clearer picture of how much your property might be worth or want to have an informal chat about general property market trading conditions. Either Heath or Adam our experienced Sales Agents & Directors will be happy to arrange a full market appraisal of your property free of charge.